Graduating confident contributors for over a century. 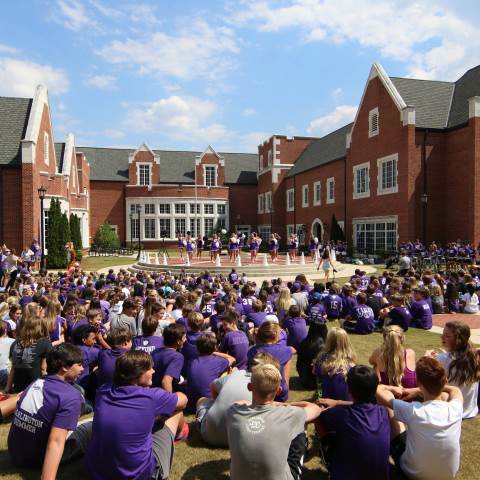 From its humble beginnings in 1905, Darlington School has grown to become one of the leading day and boarding schools in the Southeast. Academic excellence and good character have remained our focus for over a century as we equip students with the confidence, connections, and compassion they need to succeed in college and their career, and be meaningful contributors to the greater good. Founded in 1905 by John Paul and Alice Allgood Cooper, Darlington School was named in honor of a teacher by his former students. Joseph James Darlington taught at the J. M. Proctor School for Boys in Rome, where the quality of his character so impressed his students that a group of them resolved to build a school in his memory. Present-day Darlington students feel J. J. Darlington’s influence in every phase of campus life, for he believed in academic excellence and insisted upon honest, diligent effort in the preparation of daily assignments. His most vital concern, however, was the development of capable and responsible human beings, worthy of trust and responsive to it. Though he stressed the importance of sound scholarship and the necessity for discipline, his chief emphasis was always upon character and service. The school opened Sept. 11, 1905, with Founding Headmaster Dr. James Ross McCain teaching 24 boys in eight classes. The building that was to become the first permanent home was not ready for occupancy, so the upstairs room above the Rome Fire Department station in East Rome was rented for temporary quarters. The school was moved to a new location on East Ninth Street in 1906. In December 1916, DeSoto Park (the current site of Darlington School) was purchased by John Paul Cooper. After two large fundraising campaigns, the school was moved to its current location in 1923. The same year, Darlington declared itself a boarding and day school, enrolling 30 boarding students. In April 1973, the Board of Trustees voted for the consolidation of the 68-year-old institution with Thornwood School for Girls. Earlier, trustees had approved the establishment of an elementary division and boarding for secondary school girls. Resulting changes saw the primary and lower grades installed on the Thornwood campus, which was located on Shorter Avenue in downtown Rome; the middle grades continuing in the former Junior School building; and the Upper School consolidated on the main campus. In 1980 and 1988, kindergarten and pre-kindergarten were added, respectively. In 2013, Darlington sold the Thornwood campus to Shorter University and moved the primary and lower grades to the main campus, creating a true community atmosphere. Today, annual total enrollment is approximately 750 students in grades Pre-K to 12.